Dr. Ibrahim is an Assistant Professor in the Department of Dermatology. 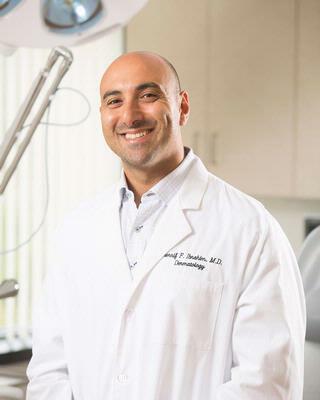 He completed his dermatology training at the University of Rochester and a fellowship in skin cancer surgery, laser surgery, and cosmetic dermatology at the University of California, San Francisco. His practice is focused on procedural and surgical dermatology including the management of skin cancer with Mohs surgery. Dr. Ibrahim sees patients at the Red Creek facility. MD, University of Washington School of Medicine. Seattle, WA. PhD, Molecular Biotechnology, Institute for Systems Biology at the University of Washington. Fellowship in Mohs surgery, facial reconstruction, laser surgery and cosmetic dermatology, University of California, San Francisco. Dermatology Residency, University of Rochester School of Medicine. Internship, Internal Medicine, University of Washington. Seattle, WA. Dr. Sherrif Ibrahim has research interests in basic and translational research related to cutaneous oncology with specific focus on squamous cell carcinoma, basal cell carcinoma, Merkel cell carcinoma, non-invasive skin imaging, and skin cancer in organ transplant recipients. Hobson JG, Ibrahim SF, Mercurio MG. "Recalcitrant Vulvar Lichen Sclerosus Treated With Erbium YAG Laser." JAMA dermatology.. 2018 Dec 12; Epub 2018 Dec 12. Tankam P, Soh J, Canavesi C, Lanis M, Hayes A, Cogliati A, Rolland JP, Ibrahim SF. "Gabor-Domain Optical Coherence Tomography to Aid in Mohs Resection of Basal Cell Carcinoma." Journal of the American Academy of Dermatology.. 2018 Oct 1; Epub 2018 Oct 01. Soh JM, Ibrahim SF, Tausk FA. "Atypical Surgical Site Infection After Mohs Micrographic Surgery in an Immunocompetent Individual." Dermatologic surgery : official publication for American Society for Dermatologic Surgery [et al.].. 2018 Aug 24; Epub 2018 Aug 24.